Embryolisse | Look. Like. Wear. Share. I never thought the day would come that I would use a mattifying face lotion, or better yet, write a review on it. 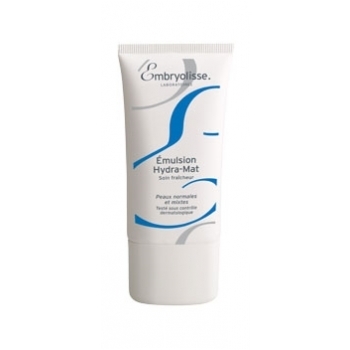 A few months ago I received a shipment of Embryolisse products, including the Emulsion Hydra-Mat lotion. When I first received it, I thought I would have no use for it and would be forced to give it away to someone. As this lotion promises to reduce shine and absorb excessive sebum, I decided to give it a try during the 4th of July weekend, knowing that I would be spending a lot of time outside. As I have mentioned before, my skin is normally on the dry side but during the summer months it tends to be more on the oily to normal side. On July 4th, I put on the mattifying lotion in lieu of my regular face lotion in the morning and followed with my makeup as normal. The cream has a very light weight texture and absorbs into the face instantly. After being outside for 8+ hours in the heat and humidity my face did not once get oily or greasy and my makeup did not slide off as it otherwise would on such a hot day. I am very impressed with the product and highly recommend it for those with oily, normal or combination skin. This is not a product that I use everyday, but rather, only on hot days when I know my makeup will slide off and get oily otherwise.